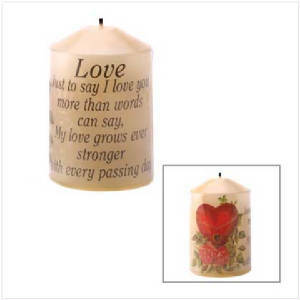 Ivory candle takes on the look of love with sentimental graphics and a charming verse. A sweet token of affection that warms any heart with a romantic glow! 30 hours of burn time. Weight 0.3 lb. Paraffin wax; organza bag. 2" diameter x 3" high. 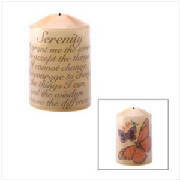 The classic Serenity Prayer creates a glowing inspiration as it beautifies an elegant ivory candle. A thoughtful gift that gives a little lift to anyone’s spirit! 30 hours of burn time. Weight 0.3 lb. Paraffin wax; organza bag. 2" diameter x 3" high. Teachers are so special, touching their students’ lives every day. 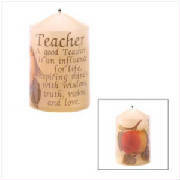 This uplifting poetic candle is an eloquent expression of thanks for their caring, sharing and wisdom! 30 hours of burn time. Weight 0.3 lb. Paraffin wax; organza bag. 2" diameter x 3" high.